Au Petit Salut is a well-known French restaurant that serves contemporary French cuisine in a three-storey home of Dempsey Hill. 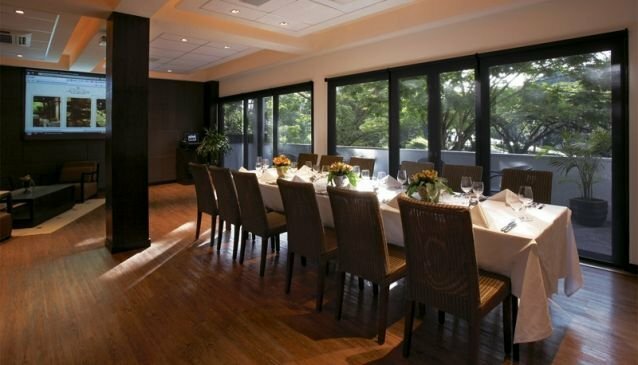 Surrounded by leafy trees, this is a beautiful setting that will match all your dining desires. From your business lunch and romantic dinner for two to your corporate function and wedding party. Appealing to fans of French fare, Chef Paul Longworth will please your palate with some toothsome recipes. Start with the Baked Burgundy Snails, bone marrow, garlic & parsley butter. Try the Pork belly, balsamic braised Bombay onions, lentils and herbs, the Baked black cod, fennel, orange puree, citrus & Pastis or the Wagyu rib eye, 'Pommes Mousseline' and red wine sauce. Then calm your sweet tooth with the Tasting Plate of Desserts. It includes a warm chocolate cake, date & fig cake, soya cheese cake, violet sorbet and mini pandan crème brulée.